The innovative "Swiss Army Knife" that extends & enhances your application of Mindjet® MindManager® in business & personal projects. Try it free today for 14 days. You'll wonder how you ever managed without. 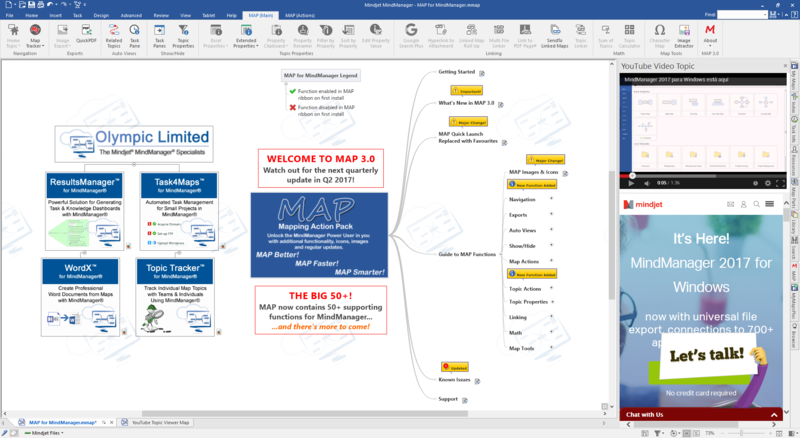 MAP for MindManager is an ever growing collection of tools and utilities that extend Mindjet’s MindManager mapping software and enables you to be more productive and expand the scenarios where MindManager can be applied in both business and personal use. Regularly updated with new functionality, MAP for MindManager provides an ever expanding collection of useful and innovative tools that will help you use MindManager in ways that are either not normally possible or more effective than traditional methods. The MAP for MindManager ribbon menu can be configured to only display those tools you use most often leading to faster workflow and quicker mapping. There is also a Task Pane menu providing access to every tool in the collection, so you are never more than two mouse clicks away from any function. Each release of MAP for MindManager is accompanied by a detailed overview video showing what is new, what has been updated, any issues reported and what the next few months holds in store for MAP users. These videos help you get up to speed with new features and help you get the most from MAP with each successive release. Take a few minutes to watch the latest release video below. MAP for MindManager functionality and commands are organized into groups allowing easy identification and quick access from the MindManager ribbon menu. The sections below describe the current groupings. Click on them to view the individual commands and functionality offered by each group. The Navigation group contains functions to help you navigate your Map collection. The Exports group contains functions to help utilize your Map content in other applications. AutoViews automate MindManager elements as you work with your Maps to save you time. Show/Hide functions help you clear Map Properties and Task Panes to save on canvas real estate. Map Actions help you perform time saving actions across your Maps such as clearing specific Task information. The Topic Actions group helps you sort Topics, resize Topic images and much more. Linking provides functions to help navigate large Maps & manipulate hyperlinked files. Math group enables you to perform basic calculations on a numerical Topic. You cam also sum selected numerical Topics. Map Tools provide simple utilities to help you Map better & faster. Learn more about the MAP groups and individual commands available in MAP. MAP for MindManager is available to purchase securely through our online store.